We have seen rapid and successful overhauls in Lawrence before, but perhaps never on this scale. Kansas is short five starters from a year ago, and in their wake arrives a decorated freshman class headed by a once-in-a-generation talent. Commitments from top-50 recruits Joel Embiid, Wayne Selden, and Conner Francamp had Jayhawk fans believing a quick rebuild was possible, but it was the May signing of Andrew Wiggins, the top player in the high school class of 2013, that has turned hope into belief. Another Big 12 championship and a return to the Sweet 16 would no longer constitute a brilliant coaching job by Bill Self, a man who has crafted many of them. Wiggins’ presence on campus has not only turned those achievements into mere expectations, but also transports hope to Lawrence that the ultimate prize – a National Title – is again a realistic possibility. Could Perry Ellis Emerge As The Most Valuable Jayhawk Not Named Andrew Wiggins This Season? 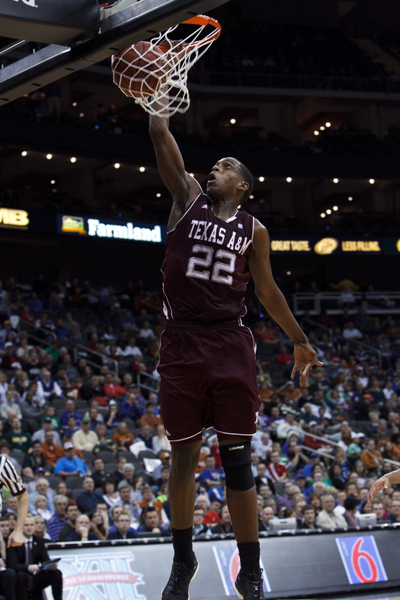 Khris Middleton could be returning to Texas A&M at exactly the right time. The preseason All-Big 12 wing played in the Aggies’ season opener, but he underwent surgery for a partially torn meniscus in mid-November and has not played since. According to a tweet by Jon Rothstein today, Middleton participated in a full practice yesterday for the first time since his injury. Although no news outlets have reported anything about his official return yet, we’ve got to think A&M will have its star back by the time it plays Florida on December 17. Without Middleton, the Aggies have managed to avoid disaster. At 6-1, they own a one-point win over St. John’s and have handled all of the inferior opponents on their schedule. But Billy Kennedy’s squad has also looked far from perfect. In its only true test of the season against Mississippi State in the NIT Tip-Off at the Garden, the Bulldogs embarrassed the Aggies, running away with the game during the first 10 minutes of regulation. Without Middleton, A&M looked lost offensively, and that has carried over throughout his month out of action. A&M struggled to pull away from the likes of Alcorn State and Stephen F. Austin, and they have been especially poor from three-point range. Against Alcorn, for example, they missed all 17 three-pointers they attempted. If Middleton can return to A&M sometime during the next week, he could suit up for the game on Saturday against Louisiana-Monroe. The Aggies can survive without Middleton in the short term, but they’ll need him at full strength when they face the Gators. Middleton brings more than just his 14.4 points per game from the 2010-11 campaign. With a developed inside game as well the ability to shoot, he’s a matchup problem for almost every team. When he hits the court for the first time since his surgery, the dynamics of A&M’s team will change dramatically — for the better. Sun Belt Conference, look out: Tony Mitchell is here. After failing to qualify at Missouri, the five-star power forward enrolled at North Texas last month, landing the Mean Green one of the most celebrated recruits in Sun Belt history. Mitchell signed a letter of intent for Mike Anderson last fall, but the NCAA ruled him ineligible because of disputed high school credits. If he completes 24 credits at North Texas during the next two semesters, he will gain eligibility for the second semester next season. Mitchell isn’t the only highly-touted freshman forward heading to Denton next year. Texas natives Jordan Williams and Forrest Robinson, who both received scholarship offers from numerous power conference schools, will team with Mitchell next season to help replace eight graduated seniors. Not even the radio crew for Arkansas-Little Rock had any idea why forward Eric Kibi played Thursday night against Denver. Although he was ruled academically ineligible last month, the junior college transfer magically reappeared to score two points in 24 minutes of action. Kibi had not played since January 2, but it seems he’s made his way back to the Trojans. That’s good news for a team in need of some size. For the first time in school history, the Florida Atlantic men’s basketball program hosted a nationally televised game against UALR January 22. And the first-place Owls didn’t disappoint, pulling away for an 88-71 win in front of a frenzied crowd that seemed to really enjoy the atmosphere.The league’s next ESPN game is between North Texas and Western Kentucky February 12. Shoutout Section: It’s hard to tell what position Travis Bureau plays for Louisiana-Lafayette. The 6’7 senior has a lot of skills, including rebounding: and boy, was that evident last weekend in a win at South Alabama. Bureau grabbed 20 rebounds to help ULL win its fourth straight game after a 3-14 start. He now leads the Rajun’ Cajuns in rebounding, even though he’s considering a guard by most. Miraculously, Bureau’s team is now just three games out of first place in the West. Three weeks ago, with coach Bob Marlin’s roster decimated due to injuries and personnel changes, that would have sounded impossible. For the first time this season, we’ll go ahead and give a shoutout to an entire game. That’s because the Denver/UALR matchup last night, won 75-72 by the Trojans in overtime, was the Game of the Year in the Sun Belt. The Pioneers needed overtime to win at home in December in the first meeting, and although they initially led 10-0 and held a 13-point lead in the second half Thursday, UALR stormed back to open a five-point lead in the final minutes. That’s when the Hallam brothers struck. Travis Hallam banked in a three to cut the Trojans’ lead to one before Chase Hallam sank a contested three from the right corner to tie the game with 1.3 seconds remaining. It’s a good thing UALR had Matt Mouzy on its side. Mouzy didn’t attempt a shot from inside the arc all game, but he made eight of 10 three-pointers—literally from everywhere on the court, making threes with hands in his face and open treys from NBA range. It was one heck of a game, broadcast unfortunately to a miniscule audience online. 1. Florida Atlantic (17-7, 9-1): The East is all but over—it’s Florida Atlantic’s division in 2011. 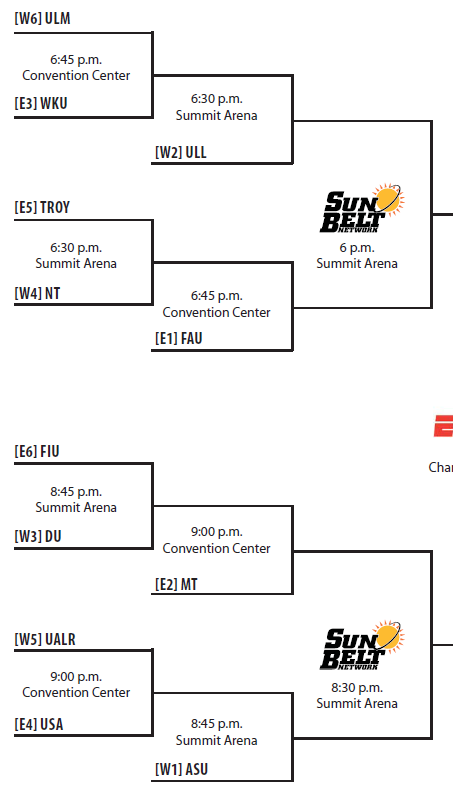 FAU leads Middle Tennessee by three games with six to play and already swept the Blue Raiders. With more wins than all of last year, the Owls continued their breakout season last night by snapping North Texas’ 17-game home winning streak at The Super Pit. Florida Atlantic roughed up the defending champs 72-55 with its lone senior, Brett Royster, on the bench for much of the game in foul trouble. Against a team that relies almost exclusively on seniors, Florida Atlantic’s underclassmen looked like the tougher and more mature players. We may be witnessing the birth of a program in Boca Raton, which begs this question: how long until the national publications decide to throw a redemption party for coach Mike Jarvis? If the Owls make the NCAA Tournament, you can bet the writers will have a field day rehashing his rocky tenure at St. John’s. 2. 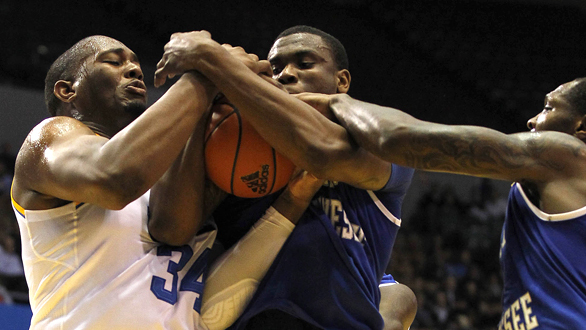 Middle Tennessee State (11-12, 6-4): If only the Blue Raiders could move to the West Division. Kermit Davis’ team pulled another upset two weeks ago by ruining Denver’s undefeated conference season, and MTSU has lost just one game to a West opponent. There’s no catching Florida Atlantic in the East, but Middle Tennessee has established itself as the second-best team in this muddled division. Davis’ team has won four of five games and looks like a prime spoiler pick at the SBC tourney in Hot Springs this March. 3. South Alabama (10-11, 4-6): There are only five players in college basketball averaging more rebounds per game than freshman Augustine Rubit. Included in that list are Maryland’s Jordan Williams and Syracuse’s Rick Jackson, as well as freakish future pro Kenneth Faried of Morehead State.A nd Rubit’s right there with him— standing tall at 6’6. That’s right: the nation’s sixth-leading rebounder is a 6’6 freshman from South Alabama. Rubit’s the frontrunner for SBC Newcomer of the Year, and he’s a big reason why Ronnie Arrow’s team has rebounded from a poor start to win three of four games. A division title is out of the question, but with underclassmen Rubit and Martino Brock leading the way, the Jaguars have a chance to build a little momentum heading into next season. 4. Western Kentucky (9-12, 4-5): It was a glorious sight: in the midst of a nightmarish season with rumors of coach Ken McDonald’s firing, Western Kentucky rolled off four straight wins. After stunning Florida Atlantic in front of a “whiteout” crowd in Boca Raton, WKU was .500 in league play and had five straight home games looming. The Hilltoppers were back from the dead… that is, until a loss to South Alabama last night at Diddle Arena. Old habits returned for Western Kentucky. All of the positive energy had vanished, the Jaguars lit up WKU from beyond the arc and point guards Jamal Crook and Khalil McDonald regressed after playing commendably during the four-game winning streak. 5. Florida International (9-13, 4-6): Talk about a feel-good story gone wrong. Isiah Thomas’s fresh roster won its first three SBC games before dropping six straight games, all by 10 points or less. FIU finally broke the slump with an overtime win at Troy last night, but even that win was difficult. The Golden Panthers lost their lead in the final minute of the extra period by fouling Regis Huddleston on a three-point attempt. DeJaun Wright bailed FIU out with a layup in the final seconds, helping Florida International avoid the East cellar. 6. Troy (5-17, 3-7): It’s quite amazing that Troy has two of the league’s best guards in Vernon Taylor and Mo Weathers and still can’t climb out of the basement of the Sun Belt East. Coach Don Maestri doesn’t have the necessary depth to run his up-tempo style this season, and they’ve especially struggled on the road. Last weekend’s win at Louisiana-Monroe was the Trojans’ first road win. 1. Denver (11-11, 7-2): The Pioneers can’t win when they don’t make threes. It’s that simple. When Denver runs Joe Scott’s offense to perfection, it’s a thing of beauty. All five players act as interchangeable parts, sharing the ball from side to side and taking only the most open of jumpers. When that offense isn’t running smoothly and the threes aren’t falling, though, Denver can’t win. Consider DU’s loss to Middle Tennessee two weeks ago. It made just three shots from beyond the arc in a loss to Middle Tennessee after inexplicably attempting just six threes. And when Denver went cold in the second half against UALR last night, it allowed the Trojans to grab the lead with a 16-1 run. 2. North Texas (16-7, 5-5): There was talk in December that North Texas could run the table in the Sun Belt. Now, the Mean Green are simply hoping to finish above .500. They’ve lost three straight games and look nothing like a team that starts five seniors. Coach Johnny Jones is struggling to find quality depth on his bench, especially in the frontcourt. The top six scorers on this team are seniors, and all have made multiple trips to the NCAA Tournament. There’s no reason for North Texas to sit at 5-5 and lose at home by double-digits, as it did last night to FAU. In that loss, Josh White played poorly and SBC leading scorer Tristan Thompson barely played in the second half for unknown reasons. It’s panic time for North Texas, and the clock is running out on the seniors who entered the year as the league’s consensus favorite. 3. Arkansas-Little Rock (13-11, 5-4): Last week, an initial 11-0 deficit against Arkansas State doomed UALR at home in a 75-64 loss. Last night against DU, another poor start had coach Steve Shields’ experiencing déjà vu. Fortunately for him, his team responded by frustrating Denver’s offense in the second half and getting just enough stops in overtime to stay in the hunt in the West. Now just two games out of first place, Arkansas-Little Rock needs to steal a few games away from home. 4. Arkansas State (12-13, 6-4): The league’s most inconsistent team took another weird turn this week with a loss at 4-17 Savannah State. It’s a good thing the game didn’t count toward ASU’s league record, because the loss was ugly in every sense of the word. The game wasn’t even as competitive as the 67-61 margin suggests, as Arkansas State shot 35 percent from the field and trailed the entire way. The Red Wolves can beat anyone at home in Jonesboro, but they’re an entirely different team on the road. The winner of the West will likely be the team that figures out how to play in unfamiliar environments. 5. Louisiana-Lafayette (7-14, 4-5): Bob Marlin can rest easy. His team beat rival Louisiana-Monroe at home, it upset North Texas and now sits just a game under .500 in Sun Belt play. Point guard Josh Brown’s return from injury has been one of the catalysts in a recent four-game win streak, and freshman forward J.J. Thomas is starting to blow up. He’s scored in double-figures in five ULL’s last eight games and went for 28 in a win at South Alabama this week. 6. Louisiana-Monroe (6-18, 1-9): There’s no question that ULM is the Sun Belt’s worst team. Playing in the more difficult West Division with a rebuilt roster, Keith Richard’s first season here wasn’t tailor made for success. The Warhawks at least fought MTSU last night to the final minute and narrowly lost to Arkansas State on a free throw by Martavius Adams with six seconds to play a few weeks ago. That’s called progress in our book.